From Byōdō-in, I crossed the Uji River and made a brief stop at Ujigami Shrine. 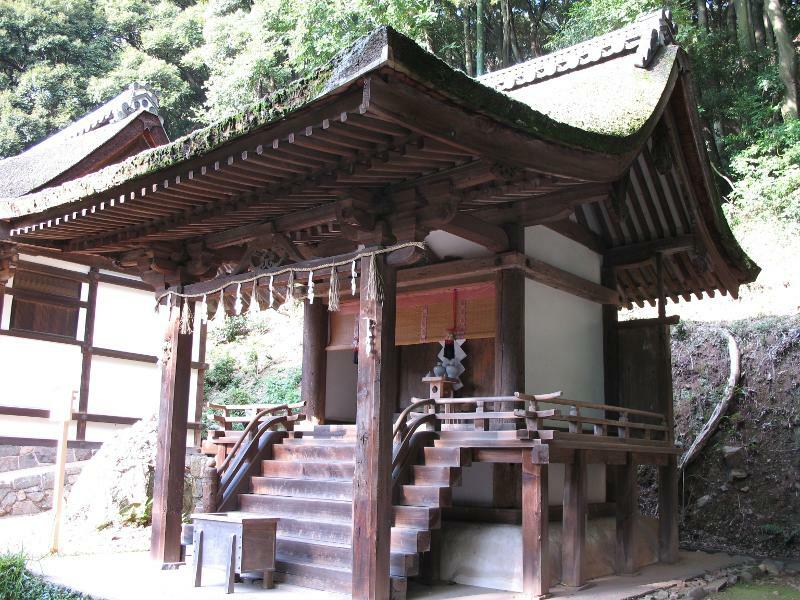 It’s small and there isn’t much to see, but Ujigami has the oldest shrine buildings in Japan. Inside this shelter are three shrines that have been dated through dendrochronology to around the year 1060. They look a bit like this secondary shrine. Of course in terms of its date of foundation, Ujigami Shrine isn’t even close to being the oldest shrine in Japan, it just has the longest standing buildings. 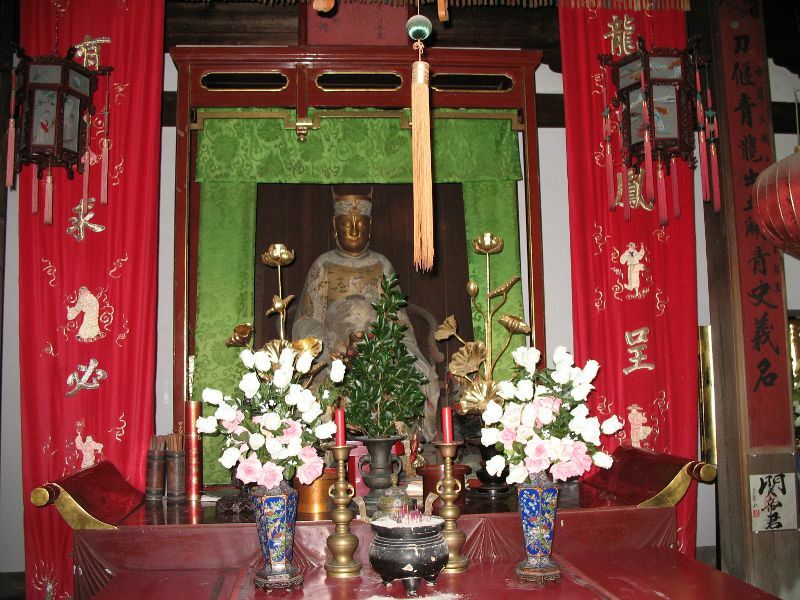 I think no one knows which shrine is the oldest, institutionally speaking, since the really old ones were built before writing was imported from China. After dropping by Ujigami Shrine, I headed back to the train station and took a train a few stops north to Mampuku-ji, my last site for the day. 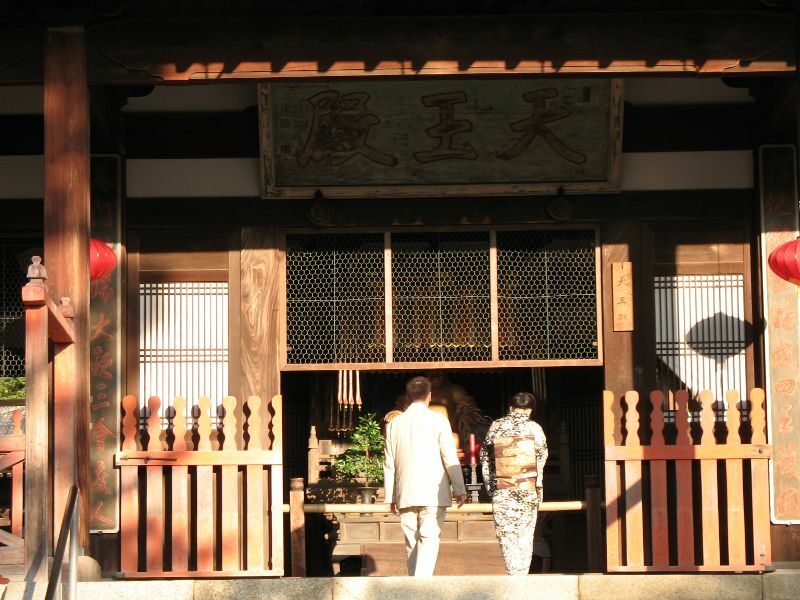 Mampuku-ji is the head temple of the Ōbaku branch of Zen. It was founded in 1661 by a Chinese monk, and the Ming Chinese influence is readily visible. Not so much at the front gate . . .
My visit was a bit rushed, because the temple was closing early. The reason was that Mampuku-ji was the 2007 host for the annual “Nippon to Asobō” event. I hadn’t heard of it before, but Nippon to Asobō (“Let’s Play with Japan”) is a night of art and entertainment with the aim of celebrating Kyoto and keeping traditional Japanese art and culture fresh and relevant. The theme for 2007 was ties with China. They aren’t pictured here, but musicians playing erhu and other traditional Chinese instruments were warming up while the venue was being prepared. As it came time for the general public to be kicked out, guests started arriving. 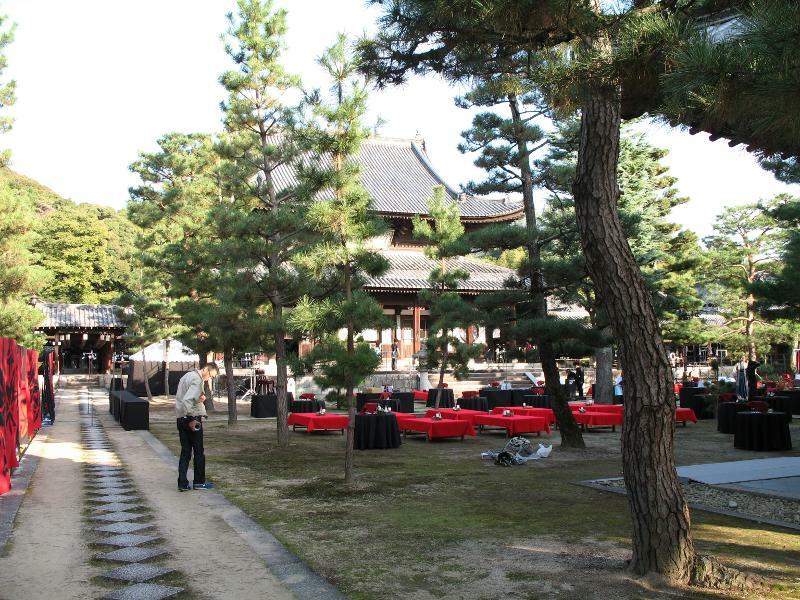 They were all dressed nicely – the men in suits and most of the women in kimonos. I saw some very pretty women in incredible kimonos, but I didn’t want to be rude, creepy, or otherwise paparazzi-like, so I don’t have any pictures of them. Alas. Just southeast of Kyoto’s Fushimi Ward lies the town of Uji, known for the tea it grows and for Byōdō-in, a temple whose image graces the 10-yen coin. 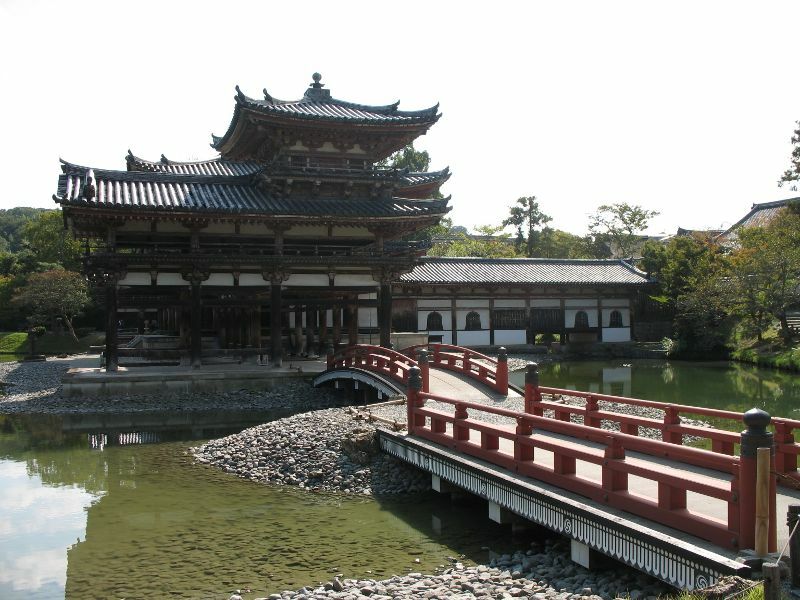 I visited Uji in October of 2007, and the temple was my first stop there. 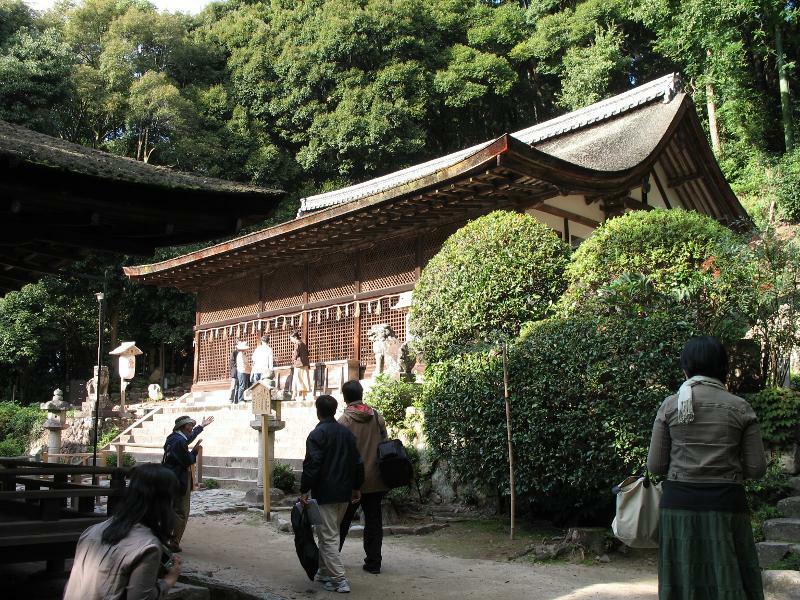 Byōdō-in was originally a villa built in 998 for the powerful Fujiwara no Michinaga. The Fujiwara clan controlled the government for centuries by marrying its women into the imperial family. Michinaga was the uncle of two emperors and the grandfather of three more, and he was effectively the ruler of Japan. 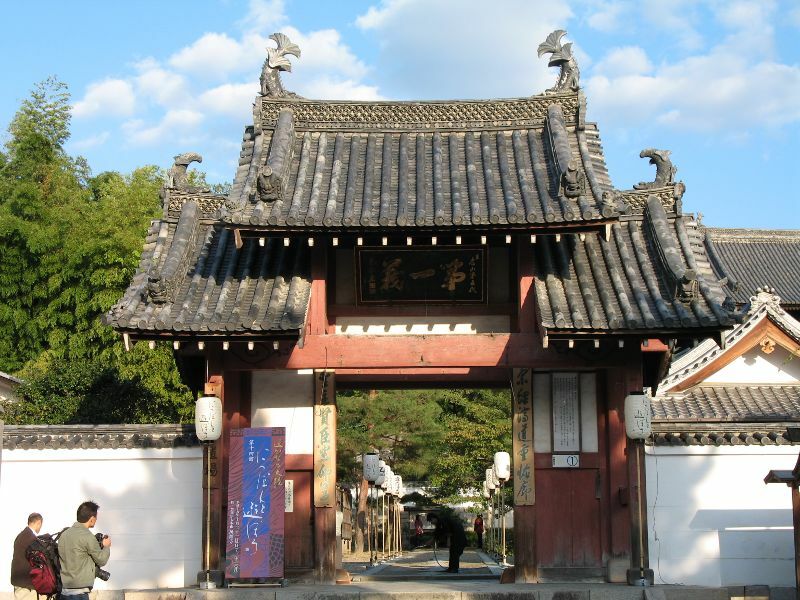 In 1052 the villa became a temple and the next year its famous Phoenix Hall was built. The name comes from the building’s appearance, with wing and tail corridors extending from the main structure. The Phoenix Hall is the only original building remaining at the temple and is a designated national treasure. Here’s a view from the side. 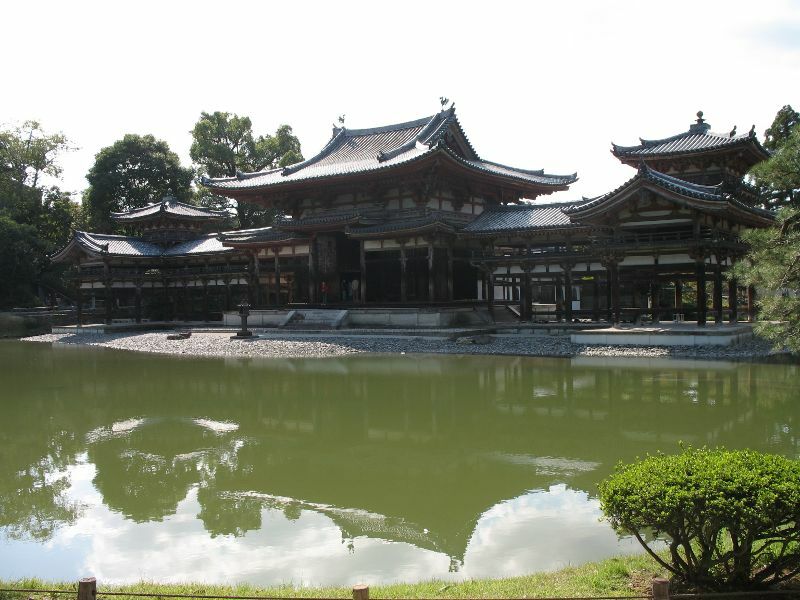 Byōdō-in was built by the Fujiwara, but indirectly, they nearly destroyed it. 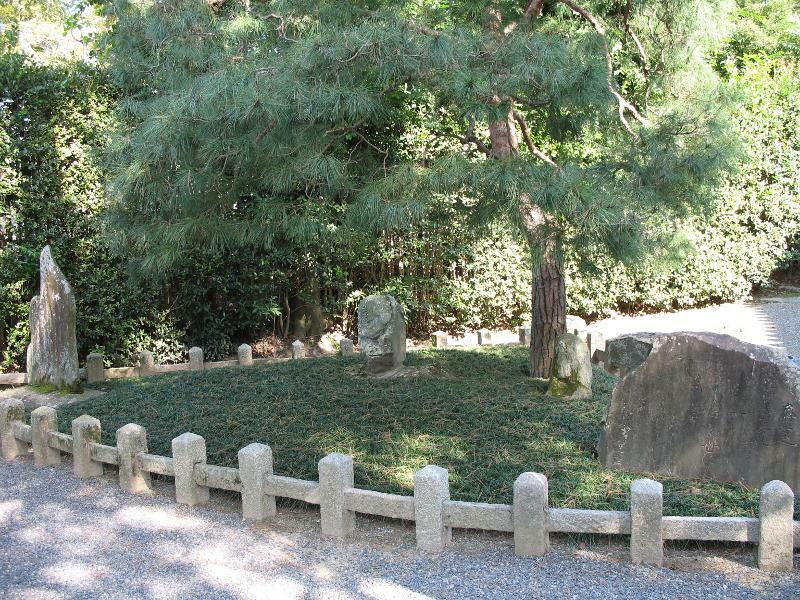 During the 10th century, the Fujiwara and other high ranking nobility made themselves exempt from the land tax. The lesser nobility then began transferring their land deeds to the exempt nobles. The lesser nobles thus acquired tax exemption, and in return they paid a much smaller tithe to their new landlords. Farmers soon did the same thing, until eventually all land fell under this arrangement. The emperor and the institution of government were crippled and made completely dependent on the noble families, and the nobles’ effective power became tied more to their holdings than to their offices. The three most powerful clans, the Fujiwara, the Minamoto, and the Taira, jockeyed for control of this new fuedal system, and the samurai class began to form. A succession dispute led to wars in 1156 and 1160 which resulted in the Fujiwara’s defeat. The Minamoto and the Taira vied to become the next power behind the throne, and in 1180 a succession dispute again led to war. However, this time it was a full-blown, nationwide civil war, and when the Minamoto emerged victorious five years later, they didn’t try to go back to the old way of doing things. 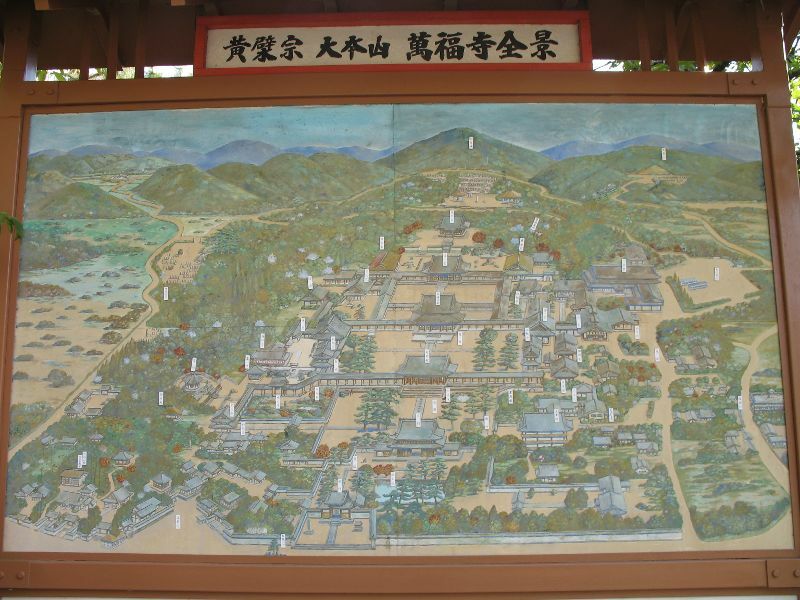 Instead, the head of the Minamoto became the first shogun, and the age of nobility gave way to the age of the samurai. What does this have to do with Byōdō-in? 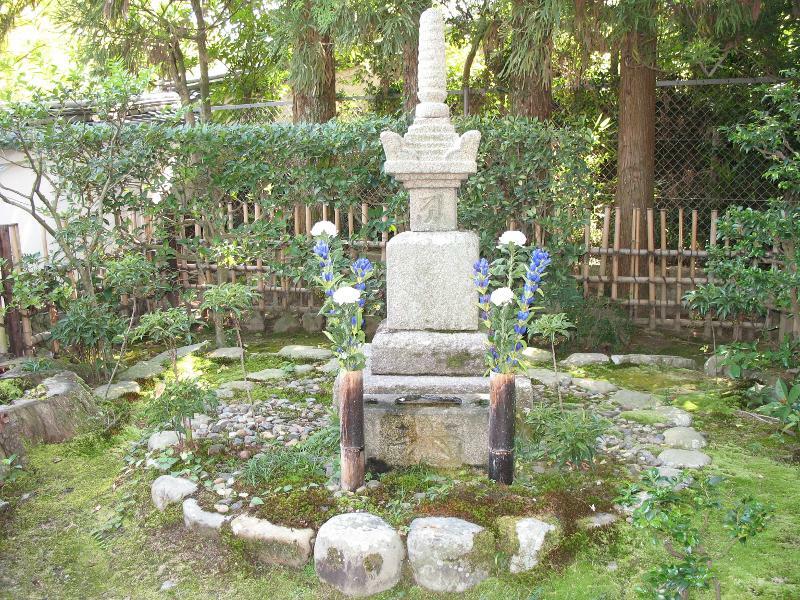 But more than 800 years later, fresh flowers still adorn his grave. I imagine he would have been heartened to know that. Uniqlo, Japan’s biggest casual wear retailer, has created a neat online advertisement called Tokyo Fashion Map. The main part of the ad is an endlessly looping series of videos of people putting on Uniqlo parkas. The loop cycles through 17 Tokyo neighborhoods, presenting a randomly chosen video for each location. Clicking on MAP in the lower right corner brings up a map that points out each neighborhood as it comes up in the cycle. Clicking on the video brings up a series of still pictures. The stills are grouped by neighborhood, each of which has a description at the beginning of its section (which you can jump to using the double-arrow buttons). Loose English translations are included for these descriptions – note that you have to minimize the map to see them. I couldn’t care less about the parkas, but as a peek at current casual fashion of average Tokyoites, Uniqlo’s Tokyo Fashion Map is pretty cool. Check it out. You are currently browsing the Erratic Dispatches blog archives for April, 2009.